Khadijah obtained her BSc. (Social Science) in Accounting and Economics from Southampton University, UK. 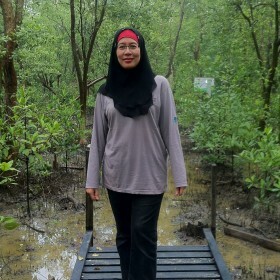 In 1996, she joined Wetlands International Malaysia as a Finance Officer. Currently, she is in charge of all the Accounts administration of the Malaysia and Brunei office. Part of her duties include working with the technical team to produce project budgets, ensures that financial reports are sent on a timely matter to government authorities, project funders and Wetlands International Headquarters. Wetlands are a part of Mother Earth, therefore it is our responsibility to ensure that the Earth is not damaged for our harmonious coexistence with other flora and fauna.